Magnetofunky No. 118. It's Saturday, April 6th, 2019. Ok,that was Blood Money - Brandon Carter, a Music Producer / Recording Artist from the South Side of Chicago (now living in NYC). He has opened shows for Kanye West, T.I., Fabolous, Ice-T, and LL Cool J. He's also a Certified personal trainer & nutritionist. Fitness model for Nike, Puma, Adidas, Men’s Health, and other major brands. CEO @ Bro Laboratories. The week was largely spent outside the lab dealing with etc. etc., and in the lab it's mostly reading and slowly climbing the learning curve on LTSpice, but also I was intrigued with a line of search I stumbled across on the Google. It started with looking at different ways of making magnet wire coils like Rodan coils, then up popped Helmholtz coils (two identical coils connected in series and sharing the same axis) that produces a region of nearly uniform magnetic field, and in some applications, scientists use them to cancel out the Earth's magnetic field. 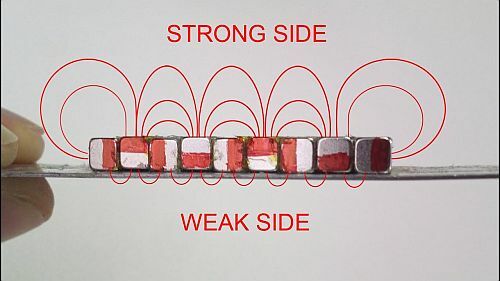 Cool, but then I came across Halbach arrays - a special arrangement of permanent magnets that augments the magnetic field on one side of the array while cancelling the field to near zero on the other side. This is achieved by having a spatially rotating pattern of magnetisation. Yeah, the effect is similar to a refrigerator magnet. Anyway, my imagination went right to antigravity and yep, on YouTube I saw that this ain't a new idea, and other researchers have proposed that gravity isn't just about mass, there's a magnetic component as well, and some have built doohickeys that demonstrated levitation through Lenz's Law (yeah, another term to look up). Then I saw this crazy video - one of many clickbait videos - purporting to show this Russian cat who built an antigravity device in his garage. I put one version of the video on my FB page that looks very cool, but, it's all in Russian, the video is jumpy, you get an indoor shot of the device taking off and landing, but not in the outdoor portion, and from the camera angles you get a strong sense that this looks like a few of the fake UFO videos out there. There's barely enough info here to attempt to replicate it, even though it's implied that this is some of Nikola Tesla's research that the government stole from Tesla literally within minutes after he died in 1943 (it's common conjecture nowadays that the US, the Russians and the Nazis were all spying on Tesla and other scientists in the thick of WWII).